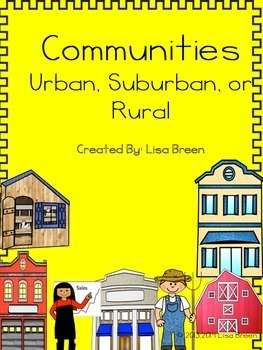 Communities: Urban, Suburban, and Rural is associated with Lesson 3 Communities Large and Small, MacMillan McGraw-Hill Companies, People and Places: We Live Together. This unit focuses on 3 community types and their similarities and differences. 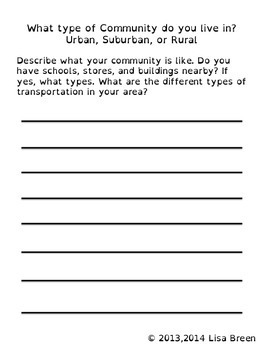 Graphic organizers allow you to identify the key points describing each community. If you shrink the reproducible pages to 85%, they fit perfectly in a composition notebook. I have added in the same activities, with a font to help dyslexic children. This font will help your dyslexic student read the pages easier. Key vocabulary terms are defined for this unit. This allows the students to use the terms authentically throughout the resource packet, so the terms become integrated into class discussions about each community. These words can also be used in the writing activity provided.